“As Far as What The Journal Published, Will Say, as Far as I Can Remember, What They Printed Were the Facts In a General Way, and the Changes Were Immaterial.” Located by The Jounaal’s [sic] Washington Correspondent, Gentry Talks Freely. 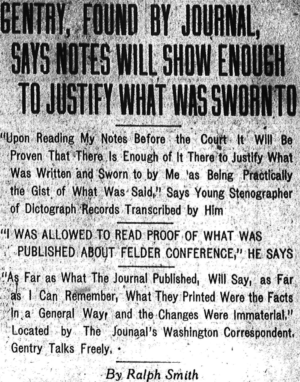 WASHINGTON, D. C., June 14.—Living under an assumed name and holding a lucrative position as an expert stenographer, George M. Gentry, of Atlanta, who made the famous dictograph notes, was located in Washington today by the Journal correspondent. He has been here since May 27. He left Atlanta via the Southern railway on the evening of May 26, following the Felder exposure. He claims to have seen no one from Atlanta other than E. O. Miles, and The Journal correspondent, though he is in communication with the members of his immediate family. Gentry’s real identity is unknown to his employers, and at his request his present address and the place of his employment are withheld by the correspondent. Their publication, he believes, might cause him unnecessary annoyance. “I left Atlanta because I feared that I might be arrested for perjury,” he said. Gentry today voluntarily made an affidavit, elaborating and elucidating the statements contained in the affidavit he recently gave to E. O. Miles. This affidavit, made today, was sworn to and subscribed before Isaac Heidenheimer, of 1226 Pennsylvania avenue, notary public, for the District of Columbia. It was witnessed by Senator William Hughes, of New Jersey and Congressman Frank Doremus, of Michigan. The original and a carbon copy are in the possession of The Journal correspondent, and Gentry himself has a copy. The affidavit was written by Gentry, without suggestion or dictation from anyone. “Unfortunately I did not go into enough detail in my previous affidavit, hence the necessity of making a further one,” swore Gentry today. Gentry swore today that he received absolutely nothing for writing his previous affidavit and that he did not receive one penny for writing the affidavit today. “I allowed myself to become so frightened because I thought that according to law, if one change was made by me, from what I had in my notes, I had committed perjury and was liable, and as I had myself made several changes during the transcribing of the notes. I felt rather guilty. However, Mr. Febuary assured me that I was writing what had been said as so I accordingly swore that what I had written was what I had heard. I discovered later that I had sworn that what I had written was a true and correct transcription of my notes. I did not realize at the time of signing the affidavit that I had sworn any such thing or I would have not signed the affidavit. The affidavit that I signed in connection with the transcription of my notes, was dictated to me and I signed it before a notary public without reading same in detail. I simply glanced over same to ascertain as to the correctness of the typewriting. “As far as what The Journal published not being correct, will say with the exception cited, as far as I can remember, what they printed were the facts in a general way, and the changes were immaterial with the exception of how they might be considered in law, about which I know very little. “In conclusion will say upon the reading of my notes before the court it will be proven that there is enough of it there to justify what was written and sworn to by me as being practically the gist of what was said. “The Journal’s position in the matter as far as I know is fair, and I believe, although I do not make the positive assertion, that what they published was given to them by Colyar, Febuary and myself. Gentry declared in his affidavit that when it was found necessary or advisable for him to return to Atlanta he will return, and will read his original notes before the court. He says that they will not be read before any private individuals, and he desires that what he reads shall be taken down and compared with what he wrote. TELLS WHERE HE HAS BEEN. While Gentry makes no reference to the matter in his affidavit, the original note book is now in the possession of a well known Atlanta attorney, whose name is known to The Journal correspondent.